The Tastiest New Entree On The Video Menu! The specialty of the house! Help Chef Peter Pepper race the maze to collect patties, cheese, lettuce and buns. As he crosses each ingredient, it falls onto a platter waiting below. 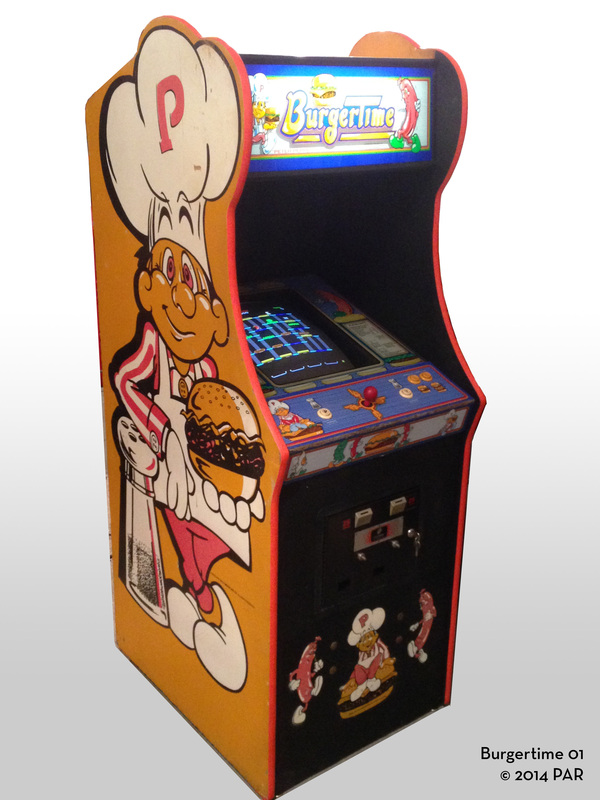 Complete four burgers and you will lout on even more challenging mazes, build more burgers and score the biggest Burgertime score ever! Destroy the pursuing Mr. Hot Dog, Me Egg and Mr. Pickle for bonus points! Hints: 1) Lure them onto burger parts right before they drop. 2) Smash the pursuers underneath a burger part. Pepper! The Secret Ingredient - You can temporarily stun Mr. Hot Dog, Mr. Egg and Mr. Pickle by shaking pepper their way. Hint: Pepper supply is limited and should be used sparingly! Replenish your limited pepper power by snacking on ice cream, french fries and cups of tea as they're served. H: 70", W: 26.5", D: 34"